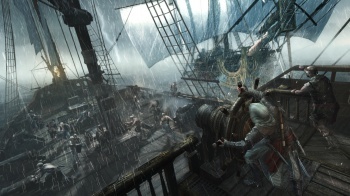 Assassin's Creed IV will have platform-specific physics to make sure you're getting all the realism your machine can handle. Sailing the salty seas is an integral part of the pirate experience in Assassin's Creed IV: Black Flag, and Ubisoft knows it. To that end, the full power of the PS4 will be harnessed to maximize the immersive feel of sailing until you can practically smell the scurvy. When playing on Sony's next-gen console you'll be treated to the very best wave and wind simulations that Ubisoft can muster. Ubisoft has mentioned that extra effort has gone into the PS4 version if Assassin's Creed IV, but has been light on specifics until now. "The PS4 version does not have any extra game content per se," explains creative director Jean Guesdon. "Graphics, obviously, will be improved to give you a more immersive feeling: leaves and plants move with the wind, waves feel even more lifelike, sails billow in the wind, etc. ... You will definitely feel the effects of our tropical storms." It doesn't seem like a very noticeable change, but Ubisoft insists that it'll make the game that much more immersive. "Wind is such an important element in the pirate fantasy that we made sure a lot of thought was put behinds its representation in our game," Guesdon says. I don't know about you, but when I'm locked in naval combat on the open seas, nothing ruins the moment like an unrealistic ripple in the waves. Black Flag sets sail on the PS3, Xbox 360, Wii U, and PC on October 29th, but wind enthusiasts will have to wait for the Q4 release of next-gen consoles.